In a large baking dish, whisk the 1 cup Kelchner's Shrimp Scampi Marinade and Sauce and chiles. Wrap each shrimp with a piece of bacon and add to the marinade. Cover and refrigerate for 1 hour; turn the shrimp halfway through marinating. Light a grill or preheat a grill pan; brush with oil. 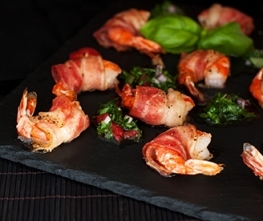 Grill bacon-wrapped shrimp over high heat, turning once, until the bacon is browned and the shrimp is just cooked through, 4 to 6 minutes. Transfer the shrimp to a platter and serve with Kelchner's Cocktail Sauce cocktail sauce and lemon wedges.